پل‌های قوسی بنایی به تعداد زیادی در شبکه‌ خطوط راه‌آهن کشور موجود هستند که عمر بیشتر آنها بیش از هفتاد سال است. این سازه‌ها اگرچه تحت اثر بارهای سرویس (قائم) عملکرد خوبی را از خود نشان داده‌اند، اما برای بارهای زلزله (جانبی) طراحی نشده‌اند، بنابراین ارزیابی لرزه‌ای این سازه‌ها برای بدست آوردن سطوح خرابی و سطوح عملکرد آنها امری ضروری به نظر می‌رسد تا در صورت نیاز این سازه‌ها تقویت، و یا از رده خارج شوند. با توجه به رفتار پیچیده این سازه‌ها، نیاز به آزمایش‌های میدانی جهت ارزیابی رفتار آنها امری ضروری است. به علت تعدد این پل‌ها در شبکه راه‌آهن امکان انجام آزمایش‌های میدانی بر روی همه آنها وجود ندارد، بنابراین جهت بررسی و مطالعه رفتار این پل‌ها نیاز به شبیه‌سازی دقیق آنها می‌باشد. برای اینکه بتوان رفتار این پل‌ها را بهم مربوط کرد؛ پارامترهای زیادی از جمله: تعداد دهانه، طول دهانه، مشخصات هندسی قوس، ارتفاع پایه و مشخصات مکانیکی مصالح وجود دارد. در مطالعه حاضر با استفاده از نتایج میدانی انجام گرفته شده بر روی پل‌های قوسی بتنی غیرمسلح، از روش اجزا محدود جهت تحلیل سه بعدی 32 مدل عددی به‌هنگام شده که دارای مشخصات هندسی و فیزیکی متفاوتی هستند، استفاده شده است. در ادامه با استفاده از تحلیل استاتیکی غیرخطی و طیف‌های پیشنهاد شده در آیین‌نامه طرح پل‌های راه و راه‌آهن (نشریه 463)، منحنی‌های تقاضا و ظرفیت مدل‌ها با یکدیگر مقایسه شده است. نتایج بدست آمده نشان می‌دهد که؛ اگرچه رفتار طولی این سازه‌ها نسبت به جهت عرضی آنها تحت اثر زلزله‌های نسبتاً شدید عملکرد بهتری دارد، اما به طور کلی عملکرد لرزه‌ای این سازه‌ها مناسب نبوده و مقاوم‌سازی آنها جهت بهبود عملکردشان ضروری است. 2Associate professor,Faculty of Civil, Water and Enviromental Engineering, Shahid Beheshti University, Tehran, Iran. There are numerous old arch bridges in Iran that have been used as railway bridges for more than seventy years. Since most of these bridges are not designed for earthquake excitation, seismic vulnerability of these structures is uncertain. This fact necessitates the investigation of the earthquake resistance of these kinds of bridges. To evaluate complex behavior of these bridges, results of field tests are required. Since it is not possible to perform field tests for all arch bridges, these structures should be simulated correctly by computers for structural assessment. Several parameters are employed to describe the bridges, such as number of spans, length, geometrical and material properties. In this study, results of field tests are used and adapted for 32 three dimensional finite element models with various physical parameters. Modal deformations of bridges at longitudinal and transverse directions is perceived from nonlinear computer simulations. Furthermore, Seismic performance of these bridges is assessed by pushover analysis in two directions and the capacity curves of the structures and linear demand spectrum are obtained using nonlinear static analysis method suggested by the Iranian standard. The crown is selected as a control node in the pushover analysis and its influence on seismic performance of plain concrete arch bridges is considered. Finally, the demand levels of the bridges based on 475 return period earthquakes are determined and compared with capacity curves. The results show that the performance of longitudinal direction is better than transverse direction, but the earthquake resistance of these kinds of bridges totally depends on the material properties and geometry of the structures. Page, J. (1993). Masonry Arch bridges. TRL state of the art review, HMSO. Fanning, P. J. and Boothby, T. E. (2001). Three-dimensional modelling and full-scale testing of stone arch bridges. Computers and Structures, 79(29-30), 2645-2662. Fanning, P. J. and Boothby, T. E. and Roberts, B. J. (2001). Longitudinal and transverse effects in masonry arch assessment. Construction and Building Materials, 15(1), 51-60. Melbourne, C. and Walker, P. (1996). Load Tests To Collapse of Model Brickworck Masonry Arches. 8th international brick and block masonry conference, New York, 991-1002. Royles, R. and Hendry, A. W. (1991). Model Tests on Masonry Arches. Proceedings of the Institution of Civil Engineers, 91(2), 299-321. De Arteaga, I. and Morer, P. (2012). The effect of geometry on the structural capacity of masonry arch bridges. Construction and Building Materials, 34, 97-106. Brencich, A. and De Francesco, U. (2004). Assessment of multispan masonry arch bridges. I: Simplified approach. Journal of Bridge Engineering, 9(6), 582-590. Brencich, A. and Sabia, D. (2008). Experimental identification of a multi-span masonry bridge: The Tanaro Bridge. Construction and Building Materials, 22(10), 2087-2099. Cavicchi, A. and Gambarotta, L. (2005). Collapse analysis of masonry bridges taking into account arch–fill interaction. Engineering Structures, 27(4), 605-615. Drosopoulos, G. A. and Stavroulakis, G. E. and Massalas, C. V. (2007). FRP reinforcement of stone arch bridges: Unilateral contact models and limit analysis. Composites Part B: Engineering, 38(2), 144-151. Carpinteri, A. and Lacidogna, G. and Accornero, F. (2015). Evolution of the fracturing process in masonry arches. Journal of Structural Engineering (United States), 141(5). Costa, C. and Arêde, A. and Costa, A. and Caetano, E., Cunha, A. and Magalhaes, F. (2015). Updating Numerical Models of Masonry Arch Bridges by Operational Modal Analysis. 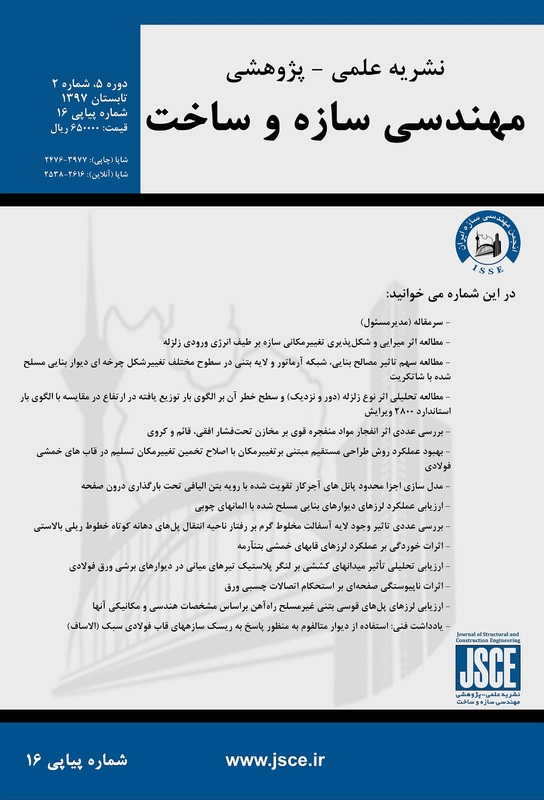 International Journal of Architectural Heritage, 9(7), 760-774. L Pelà, L. and Aprile, A. and Benedetti, A. (2009). Seismic assessment of masonry arch bridges. Engineering Structures, 31(8), 1777-1788. Pelà, L. and Aprile, A. and Benedetti, A. (2013). Comparison of seismic assessment procedures for masonry arch bridges. Construction and Building Materials, 38, 381-394. Yazdani, M. and Marefat, M.S. (2013). seismic assessment of six meter spans plain concerete arch bridge. journal of seismology and earthquake engineering (JSEE), 15(1), 72-82. Yazdani, M. and Marefat, M.S. (2012). Seismic assessment of twenty-meter spans plain concrete arch bridge. Proceedings of the 4th International Conference on Seismic Retrofitting, Tabriz, Iran. Bayraktar, A. and Türker, T. and Altunişik, A. C. (2015). Experimental frequencies and damping ratios for historical masonry arch bridges. Construction and Building Materials, 75, 234-241. Sevim, B. and Bayraktar, A. and Altuniik, A. C. and Atamtürktür, S. and Birinci, F. (2011). Finite element model calibration effects on the earthquake response of masonry arch bridges. Finite Elements in Analysis and Design, 47(7), 621-634. Sevim, B. and Bayraktar, A. and Altunişik, A. C. and Atamtürktür, S. and Birinci, F. (2011). Assessment of nonlinear seismic performance of a restored historical arch bridge using ambient vibrations. Nonlinear Dynamics, 63(4), 755-770. Gencturk, B. and et al. (2014). Capacity Assessment of the Titus Tunnel Bridge Using Analytical and Numerical Techniques. Journal of Performance of Constructed Facilities, 28, 349-62. Ahmadvand, Sh. AND Khaji, N. (2010). Seismic Rehabilitation of Masonry Arch Bridges Using Post-Tensioning Method. Journal of transportation engineering, 1(2), 1-19. Zampieri, P. and Zanini, M. A. and Modena, C. (2015). Simplified seismic assessment of multi-span masonry arch bridges. Bulletin of Earthquake Engineering, 13(9), 2629-2646. Marefat, M. S. and Ghahremani-Gargary, E. and Ataei, Sh. (2004). Load test of a plain concrete arch railway bridge of 20-m span. Construction and Building Materials, 18(9), 661-667. Marefat, M. S. and Ghahremani-Gargary, E. and Ataei, Sh. (2003). Static and dynamic testing of Akbar Abad plain concrete arch bridge. Journal of civil and surveying Engineering, 37(1), 13- 25. Ataei, S. and Jahangiri Alikamar, M. and Kazemiashtiani, V. (2016). Evaluation of axle load increasing on a monumental masonry arch bridge based on field load testing. Construction and Building Materials, 116, 413-421. Chen, W.F. (1982). Plasticity in Reinforced Concrete. New York, McGraw-Hill. Yazdani, M. and Marefat, M.S. (2016). Assessment of Effects of the Number of Spans on Static Capacity of Six-Meter Plain Concrete Arch Bridges. Concrete research journal, 8(1), 71-84. Ministry of roads and transportation. (2008). Road and railway bridges seismic resistant design code (No. 463), Iran. Roads, housing and urban development research center. (2015). Iranian code of practice for seismic resistant design of buildings (standard No. 2800), Iran. Naeim, F. (2001). The Seismic Design Handbook. New York, Chapman & Hall.